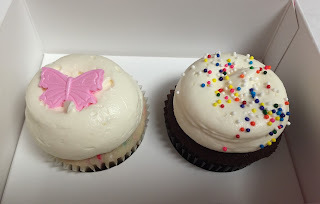 My husband brought me back surprises again and he had 2 cupcakes from Georgetown Cupcake and 1 pastry from Dominique Ansel. He saw some Mother's Day cupcakes at Georgetown Cupcake and he got Vanilla Butterfly Surprise and Mother's Day Chocolate. As always, the frosting was tall and looked airy. 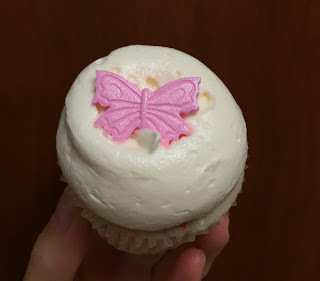 There's a shiny pink butterfly. 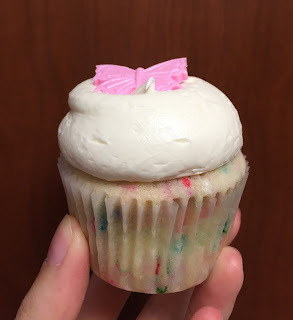 The vanilla flavored cupcake had colorful sprinkles inside and I think it's the surprise? The frosting was light and fluffy, but it's very very very sugary buttercream for the already-sweet cupcake. 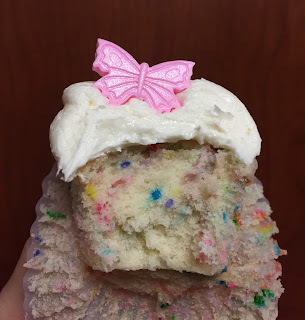 The pink butterfly was soft and wasn't as bad as I thought like marzipan or fondant. Other reviews of Georgetown Cupcake.